I don’t know what it is with this year, but I just can’t seem to stick with a book. My reading volume has dropped to the lowest in years and I don’t like it. I could blame my new boyfriend, but he’s actually massively into books, took me to Hay-on-Wye on our first weekend break, bought me more books and loves to cuddle up with a book. (So it’s definitely not his fault…) I guess I’ll just have to blame the fact that I’m flat hunting again and spending more time than ever in the gym. Or something. EXCUSES. Get back to reading, girl. In April I did read two really good books though. It’s a start. 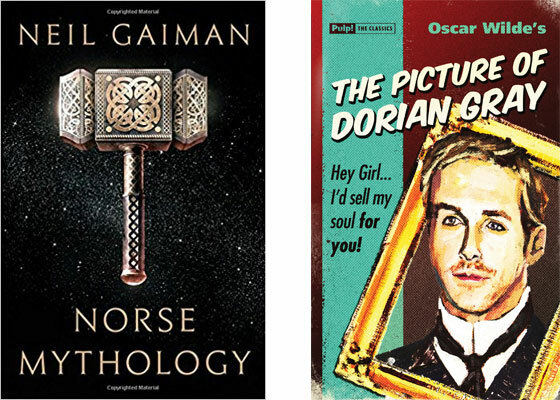 Not quite what I expected, Gaiman’s latest takes on the story of the Norse gods in a short collection of episodes – so if you’re expecting a modern epic you’ll probably disappointed. It’s certainly a great introduction to the subject for someone who doesn’t know a lot about it (like myself) as well as young readers, and I think even if you’re a bit familiar with Norse mythology this is still a very interesting interpretation as Gaiman pieced it together from bits and pieces as told in different versions over time. In one way, this makes the stories very rich and detailed, but at the same time they don’t go much beyond the bare facts. There is very little emotion, and not much actual storytelling – the style is brief to the point of feeling clipped, and the gods remain fairly one-dimensional, described over and over by their same old characteristics. But then again I guess ancient gods don’t undergo much character development in general, and they don’t necessarily have human traits or feelings. I’d probably file this one under ‘informative and entertaining’ rather than a memorable and breathtaking read. I tried Dorian Gray before and gave up a few pages into the first chapter, somewhat put off by the pretentiousness of Basil and Henry’s conversation about art. A few months later I started dating someone who proclaimed it his favourite novel, and promptly bought me a copy, so I decided to give it another chance – and actually quite enjoyed it. I kind of expected it to be a lot more scandalous, but I guess it must have been pretty shocking in its day. I found it strangely reflective of our own time actually. When you think about it, Dorian’s obsession with his appearance and the constant conflict he faces between his own self and the version of him reflected by the portrait isn’t a million miles off the identity struggles created by today’s selfie culture, where any photo must be obsessively run through a number of Instagram filters and retouched by beauty apps before we feel confident enough to share it across every social media channel. In a sad reversal of the Dorian Gray concept, it’s usually the perfectly edited picture we present to the world, while our self-esteem becomes the nasty thing festering in the attic. Our views on aesthetics and morality may have changed since the days when this book was a true shocker, but for as long as we’re human we’ll always struggle with vanity, appearance and the conflict between our true identity and the image we’d like to show the world – and I think in that regard Wilde’s story will remain absolutely timeless.